I still have an entity in Singapore but not sure if its suits for a China-setup. So, this post is to help Nicky and others just getting their feet wet in the wild world of Chinese cross border e-commerce. Just like any business, how much are you willing to invest upfront? I’m a believe in the “lean startup” method, where you start with as little investment upfront as possible, and instead learn what people want rather than assuming it. Same goes here for Chinese e-commerce. If you’re living in China already, you have an advantage. Get some samples shipped to China from your home country (or product’s origin) and attend some relevant meetups or trade shows. Show them the samples, and try to even get pre-orders. We have a good podcast with Dan Harris about 9999 finding Chinese distributors. Depending on your distribution strategy, this is a low cost way to get into the Chinese market. But not exactly cross-border e-commerce – unless you are the one holding the stock in a free trade zone in China and then shipping to their end buyers (a form of drop shipping). But rather than calling it a distributor, you can have a local friend who has a Tao Bao shop or a Wechat shop to help you test the waters. They can list their product on their shop for you and see if it gets some initial traction. So a benefit of selling a new product in China with a Chinese FTZ (free trade zone) is that they can expedite the classification and duties of a newly imported good. Though you need to remember that each free trade zone is different, and my personal experience lies in Shenzhen’s Qianhai. So confirm with logistics providers in the free trade zone of your choice. Yet most of them will help you with small order quantities into China, help you warehouse them and classify them faster. This is the whole idea of these government zones – to promote businesses to import the goods the correct way (rather than smuggling). So once you have a good idea your goods will sell in China (from the focus group or distributor testing above) – you can leverage a free trade zone for a smaller quantity. Also, service providers in these Free Trade Zones are more accustomed to working with non-Chinese companies. Many of them provide solutions for you to have them collect the money on your behalf, ship the goods on your behalf, marketing, and more. Of course, you could just do it where you ship each package (B2C) direct from the country of origin. It is worth noting that of course the delivery time will be longer, as well as the custom duties will be the responsibility of the buyer. Many times Chinese consumers (as well as any consumer) is not aware of the rates and can be up for a big surprise. This can affect your brand negatively, and get you bad feedback and bad word of mouth marketing. If you do decide to ship direct from overseas, make it clear on your marketing materials in whichever marketplace you choose. You may want to give the consumer a basic idea of the import duties (tax) that they will be responsible for, so they are ready for it. Now, for the tricky part – how do you want to setup your company organization. As a startup, you may not have unlimited funds to invest in inventory, company formation, and marketing (as well as a load of other things) – so you need to choose wisely. While the ultimate long term structure is a full Chinese company (WFOE or maybe joint venture with local partner) – you can sell goods in the Chinese market without having a company here. Such platforms as JD.com and Taobao have overseas divisions that are looking to get new products and hot trending goods into their marketplaces more. They will allow you to create an overseas account and then pay you in that overseas company account. But they will have a more strict setup policy and a high deposit. This is to ensure the trust and safety of your business in the Chinese marketplace. If the goods are bad quality or you “disappear” – they will have your deposit to protect them on the defects and other negative outcomes from a non Chinese company going AWOL. So you need to weigh the pros and cons of using an offshore (non-Mainland Chinese) company or a local Chinese company to sell your goods. Of course these can change as your business grows and develops. Business owners around the world have learned something – that Wechat and Weixin are not truly the same thing. Weixin is the Chinese name of Wechat, and opening a Weixin Official account requires a Chinese registered company in order to do so. If you use a USA company to open a Wechat official account, you will get one, but it will not be visible to Mainland Chinese users. Which is crazy, because the majority of the marketshare of Wechat is inside of China. We believe this is due to censorship requirements, but as a business owner, you need to decide to open a Chinese company for the purpose of getting an official Wechat account that can reach Chinese people. The other way is to trust someone else to register your official Wechat account, such as a Chinese person or locally registered Chinese business. But the risk here is clear – they are the true owner of the account, and as of writing this – it is not possible to transfer an official Wechat account from one company to another. I’ll leave this one up for you to decide. There has been some workarounds, but you need to have special relations with Tencent in order to get an exception to this conundrum. Maybe there will be more public ways, but the Chinese censorship department wants to protect its people from dangerous marketing materials that is unrestricted. Many successful cross border sellers I know don’t even bother with an official account. They just use their personal Wechat account and post on their moments. They then build up a network of other personal accounts and have them become an informal distribution network. This isn’t going to be a smooth logistics operations. This is literally posting on your moments (like a Facebook wall) your photos and product description and maybe a price. You then ask the viewer to send you a private message for details. You have them directly send you the money to your personal Wechat wallet account, and then ship the goods to their address. This is a higher risk to the buyer, as you can just take the money and run. Or even if you do ship the goods, what if it is lost in transit? There is no dispute protection for the buyer, and they have to trust you will honor the sale when they send you a new private message in the following days. Yet, there are still tons of buyers and sellers going out on the Wechat moments making business happen. This is a good way to get things started. You may want to get a new mobile phone and a new wechat account for this, to separate your business and personal identity. In China, as well as the rest of the world, it has been the rise of the blogger. These are people who are “influencers”. Who have an audience around a certain topic, say fashion shopping, sports, food, and have built up trust. For a price, businesses can pay these KOLs to post a promotion to their audience. This has been a popular way to get your unknown product to be exposed to the Chinese market. While prices have been on the rise, you can use this tactic to speed up the process of building up word of mouth and awareness of your product. It will also save you much needed time at the beginning of your business to determine if Chinese people will be willing to buy your product or not. My friend Kim from Parklu.com has a great service for finding and working with KOLs, and I recommend you reach out to them for some ideas on budgets and campaigns you can run. I hope today clarified some things more than confused you! While some clients we work with are rushing to open a Chinese company, office, bank account, staff, and the works – and we’d love to do business with you – we often recommend doing it step by step. Working with a logistics service provider who can help receive and ship goods in China on your behalf is a good way. But like any business, having a good marketing and sales strategy BEFORE you invest a big chunk of money is a formula for success. While it is a bit “dangerous” for me as a consultant to advise you to use “grey” tactics such as using personal wechat accounts and personal bank accounts to start – you need to hustle a little bit at the beginning in order to validate the business and build your confidence. How About You? 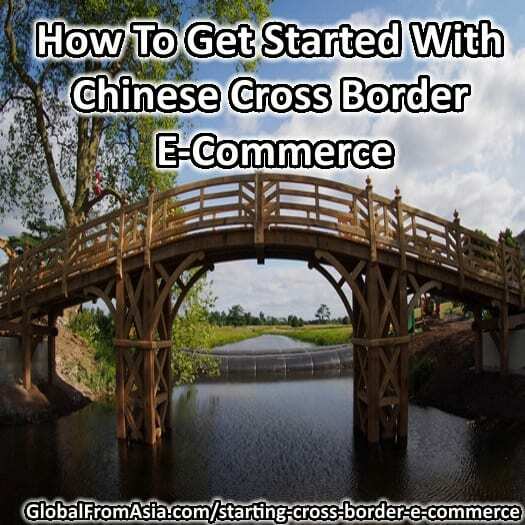 How’s Your Cross-Border E-commerce Business Going? How did you get started? Now it’s your turn, I’d love to hear your comments and experiences in doing Chinese e-commerce via cross-border tactics. How did you get things started? How are you structuring your company now? Let’s share and learn together in the comment section below. Hi Michael, I am just moving to china for a while to explore opportunities. Your blog is certainly helpful and gave me already some good ideas. Thanks God my wife is chinese. That’ll make things probably a lot easier. Thanks heaps for your advise. Thanks Michael, very helpful advice here and I certainly appreciate your sharing so much information. When shipping samples to China for meetups and shows, will the goods still need to go through customs? Additionally, are they any events on the mainland that you would recommend going to for feedback and product review by locals? Apologies if you’ve answered these questions in the past. I’m starting an E commerce website in Australia and China. What’s the best way to have a product shipped to the locals on the mainland? Isn’t there a warehouse for Taobao or Alibaba which can store you products locally and ship straight out to residents of China making it quicker and more cost effective on freight costs? Like 3-5 day turn around using EMS or HK post?